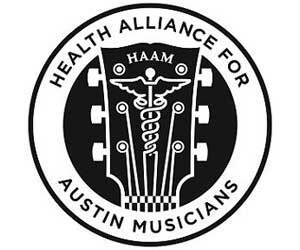 The mission of Health Alliance for Austin Musicians is to provide access to affordable health care for Austin’s low income, uninsured working musicians, focusing on prevention and wellness. Austin is the “Live Music Capital of the World,” yet many professional working musicians are self-employed and rarely have access to health insurance. Without insurance, they can’t afford preventive health care, including primary medical care, basic dental services and mental health counseling. The HAAM staff conducts eligibility and enrollment services for the musicians. Once enrolled, HAAM works in partnership with affiliate service providers Seton Healthcare Family (primary medical care), St. David’s Foundation and Capital Area Dental Foundation (basic dental care), SIMS Foundation (mental health and addiction recovery), Estes Audiology (hearing health), and Prevent Blindness Texas (vision health). This coalition of service providers focuses on prevention and wellness and works to assure that musicians have access to caring and affordable healthcare.